Among the potential ingredients for the marketing mix of a high tech software or hardware company, PR (Press Relations) is very high on my list. There’s a good reason for it. It is often the most cost effective tactic you can use to generate leads, build the image of the company and create the credibility that helps you close more sales. Maybe best of all, it’s possible to do it on a shoestring budget if you’re a capital-challenged startup company. The basic message here is that PR usually shouldn’t be started until the company and product are ready. Once you go out for PR, there’s no looking back. You can’t undo it. Maybe you’ve heard the old saying “There’s no such thing as bad PR”. Don’t believe it—it’s a lie! The only kind of PR that will help boost your business is good PR. Bad PR and even so-so coverage is to be avoided if possible. In addition, it’s not really possible to do a “small PR campaign”. You can’t test PR–(testing is normally a GREAT marketing technique)– like you can many other marketing programs. It isn’t advisable to go out to a couple of publications with a press release to “test the water” and see if you get some positive coverage. The problem is that once you’ve done that your important announcement is no longer “news” to other publications that may have otherwise provided coverage. You see, the “product” that publications are interested in getting from you is THE NEWS ITSELF. Once it’s published in another publication, it’s no longer as newsworthy to others. Press Releases are as fragile an asset to your company as a seat on a particular flight is to an airline. They aren’t static assets, but time-sensitive opportunities to promote your company. So when you decide to go out with news, you need to go out big. Go out as big as you can afford to, anyway. News releases generally need to be timed to hit all relevant publications at the same time. This is a bit challenging, since you may have relevant publications that are weeklies, monthlies and/or websites where the news might posted near real-time. These days of course you also want to distribute your news on all the appropriate social media such as LinkedIn, Twitter, Industry Blogs, etc. So while this can be a bit tricky from a timing perspective, use this staging technique to ensure it hits all at the same time: send your release to the long lead-time pubs first, but “embargo” the release until the general release date. If you are dealing with legitimate news publications they will respect the embargo and won’t publish the news until your official release date. So when should you use PR as part of your marketing mix? These are some of the major reasons that you would put out a press release for marketing reasons, although I’m sure you can think of more. Public companies will often have a greater flow of releases, because they are dealing with a dual purpose of marketing and investor relations. This can often be problematic, but that’s a subject for another day. Other questions relate to the mechanics of producing and placing news with the media. Should you hire a outside PR agency, or should your marketing department handle it internally? Should you hire a dedicated internal resource to handle the PR function? Just put it out over the Internet and hope for the best? There are lots of ways to handle PR and still do it successfully. One size doesn’t fit all—it really depends upon the situation. The first aspect to look at is your level of resources. PR is one of my preferred marketing activities, so I recommend that you don’t skimp in this area – relative to your specific situation. But there are still situations where the money just isn’t available, for whatever reason. An outside PR firm can always be helpful, particularly if you’ve never been involved in a PR campaign before. But if you’re in a thinly funded startup company, don’t be deterred. To be successful in PR, it’s far more important to have REAL NEWS than it is to have a lot of money. (Of course, money doesn’t hurt!) So if you just can’t afford outside or experienced PR assistance—do it yourself. One caveat is that just putting it out on the Internet without following up isn’t really Press Relations at all. That’s potentially useful for SEO purposes, but isn’t likely to lead to any significant press coverage by itself. The second thing to consider from a campaign implementation perspective is “how big is your news”. If it’s solid, worthy of publication, but not earth shattering—maybe you can handle it internally. At most, maybe you need someone to help with the writing of the release itself, but the potential coverage isn’t big enough to spend a lot of dollars attempting to place it. If on the other hand the news is “big stuff” (with a corresponding large potential payoff), it’s really a good idea to hire an outside firm or an experienced inside resource to maximize the potential, if you can afford to. Next, how big is your market? If you are in a large, horizontal market, with a great number of large publications—that points to the need for a more professional effort. Contacts with the editors are critical in this instance and an experienced PR professional can be worth their cost many times over. If on the other hand your market is a small vertical niche, a PR professional may not be money well spent, particularly if you have a limited marketing budget. In this case you should be able to build and maintain good relationships with the limited number of editors and writers who are working for the small number of trade publications covering your industry or market segment. Another typical question is: will the PR opportunity be ongoing? If you’re going to put out 2 press releases a year, how you go about staffing the function is usually very different than if there are going to be 2 blockbuster releases each month. So the stage of growth of your company should also help guide your tactical PR implementation. Lastly, what’s your business culture and style? Do you like to get the best outside experts and use them when you need them, or do you prefer to hire people with expertise as permanent members of your staff? Conversely, do you enjoy learning the specifics of the task personally so you can apply the knowledge yourself? If you choose to learn yourself, make sure you get someone with PR experience to guide you and serve as a sounding board. Conducting extremely successful PR campaigns involves many fine points and vagaries, which can’t be addressed in a short article such as this. But I believe anyone should be able a do a good solid PR job, if they take the time to learn and put forth the effort. It’s not a mystery and for most technology companies PR should play a very prominent role in there promotional strategy. I’d love to hear about your own PR experiences–post a comment below to continue the discussion. 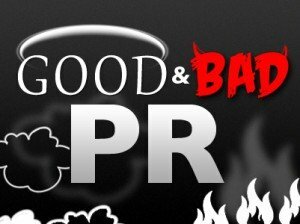 Good post, but I feel obliged to point out that PR stands for ‘public’ relations, not ‘press’ relations (which we’ve been referring to as ‘media relations’ for at least two decades now), and that the form of public relations you describe – marketing communications, which supports a company’s marketing plan, is only one aspect of PR. As even the biggest of high tech firms have learned (e.g. Microsoft during the anti-trust investigation era), most companies can benefit from the entire range of PR services, including internal communications advice, government relations, issues management, and crisis communications. Sorry to feel the need to respond, Ruth, but that’s a very self-serving comment. You don’t get to define what an abbreviation means, regardless of your knowing tone. PR can stand for press relations or it can stand for public relations as well and it’s very common for it to represent either. For decades it’s been used for both. In fact using PR to stand for press relations rather than public relations is in my opinion a newer usage. This article was about press relations as I defined it. The services you mentioned are most typically of interest to very large companies and those selling to consumers. The definition for this article is more universally useful for all companies. LOL – most of the high tech PR accounts on which I worked during the dotcomm boom were niche software, B2B clients – SAP, Veritas, Nortel…. And as someone who worked for one of the largest global PR firms, I think the actual industry and I do get to define what PR is – and what it stands for. So I’m not sure what you find self serving about the comment. Of course VC can stand both for venture capitalist and Viet Cong.